Apartment in beachfront of Fuengirola seafront. It has a small interior room with bed 135 and cupboard with two doors. The living room has a sofa bed for two people, and two-door wardrobe. Air conditioning table for four and TV cabinet LED 32 '. The kitchen has large refrigerator, microwave and useful for cooking. The bathroom has a shower with seat, all finished in tile, for comfort and screen separation. On the terrace with superb views it has another closet for shoes and a terrace table with two chairs from where you have magnificent views of the beach and the atmosphere of the city. The apartment comes fully revised and household linens clean and useful kitchen with all supplies for the detergent, softener cleaning, bleach dishwasher, cleaner paper napkins. 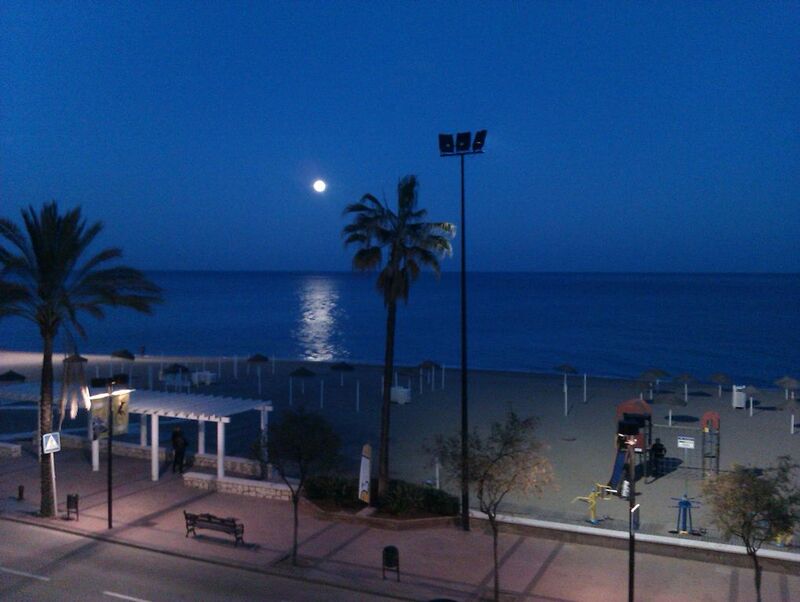 From this link you can see the seafront of Fuengirola in real time. The picture changes every minute. With beach conditions, temperature, sea state and weather conditions. It is a camera located in another building, but is oriented to see the beach in front of my apartment. My apartment is on the second floor facing the center of the image. During the day from inside the apartment you can see the equipment for gymnastics and evening is the palm that is more enlightened. The bathroom has a sink and cabinet, a shower with thermostatic tap, with screen, seat slip work and to give strength and security in the shower floor. The apartment is newly renovated and is delivered clean and with all the necessary supplies. We also supply detergent, softener and bleach for the washing machine. It is equipped with paper and detergent for the bathroom. It has paper napkins paper towels and detergent for the kitchen. my husband and I have just returned from a 2 weeks stay. Esteban met us at the train station and drove us to the apartment. The apartment is in a great location right across the road from the beach and it has everything you need for a comfortable stay, even a kettle and a toaster. Everything in the apartment is very clean and very well looked after. It is within easy walking distance of everything in Fuengirola. There is a lift as well as stairs and the common areas are also well looked after. We enjoyed sitting out on the balcony looking out at the fantastic view and watching all the people passing by. Esteban is a very good owner and even picked us up the morning we left and took us back to the station. We would happily recommend the apartment. We are returning to Australia shortly but if we return to Fuengirola I would love to stay here again. Thanks for your comment. I'm very happy you had fun in Fuengirola in my apartment.When you decide to come again, I'll be happy you stay in the apartment again. I'm thankful for how you care the apartment during your hollidays. We would just like to say thank you for the wonderful time we spent in your apartment. From the moment we contacted Esteban, till we left for home, he made everything so easy.We were met at the train station and left back on day of departure for no extra charge. The apartment is exactly as advertised,small but perfect. perfectly comfortable for 2 people. Close to everthing and the view was wonderful. For the price I believe we got a bargain and could have asked for no more.All in all a perfect holiday for a couple. For me it is important that people who visit us are happy with their stay. Thanks again and I hope you come back to visit us. Pasamos unos dias muy buenos. El dueño vono a recogernos a la estacion y no hubo ningun problema. El piso esta justo en frente de la playa y muy limpio. El piso estaba super limpio, y en muy buena zona,esta justo en frente de la playa. El due?o nos vino a recoger a la estación y todo fue perfecto. Fuimos a este monísimo apartamento mis amigas y yo a pasar unos días y la verdad es que nos lo pasamos genial!!! tenemos cuentas de volver en cuanto podamos. La playa está más que cerca, te levantas y tienes un pie en el agua :D está muy céntrico y puedes ir andando a cualquier sitio. El trato con los dueños fue excelente, ya que nos trataron genial y nos hicieron la estancia lo más fácil posible. Sin duda un destino que recomiendo. Fué un placer que pasarais unos días en nuestra casa, y espero que volvais pronto. In Fuengirola, heart of the Costa del Sol, in the best area of ​​the promenade 20 meters from the beach, 200m from the port city. The apartment is a second front to the sea floor. The commuter train station are at 15 minutes walk from the apartment and has direct liaison to the airport in 34 minutes and the train station of Malaga or the city center. The bus station of Fuengirola is a 15-minute walk from the apartment, where you can connect with the whole province of Malaga or any other Spanish province. There are also trips to Morocco and some European cities. The cities of Marbella and Malaga are 30km from Fuengirola. From this link http: // www. webcamfuengirola. eu / can see the promenade of Fuengirola in real time. The picture changes every minute. With beach conditions, temperature, sea state and weather conditions. Golf: In the area are many golf courses there, choosing among 12 golf courses within a radius of 12 kilometers a great deal on a very small area. Para realizar una reserva tendrá que pagar una fianza de 100€ . El pago del alquiler se hará cuando llege al apartamento. Quedando los 100€ de fianza hasta el final del periodo. Se le devolverán al salir del apartamento, si no hay que descontar alguna rotura.